surgical puncture of a joint cavity for aspiration of fluid. Aspiration of fluid from a joint performed by needle puncture. /ar·thro·cen·te·sis/ (ahr″thro-sen-te´sis) puncture of a joint cavity with aspiration of fluid. the puncture of a joint with a needle and the withdrawal of fluid, performed to obtain samples of synovial fluid for diagnostic purposes. It may also be used to instill medications and to remove fluid from joints to simply relieve pain. A local anesthetic is usually administered; surgical asepsis is observed in the procedure. Normal synovial fluid is a clear, straw-colored, slightly viscous liquid that forms a white, viscous clot when mixed with glacial acetic acid; if inflammation is present, as in rheumatoid arthritis, the fluid is watery and turbid, and its mixture with glacial acetic acid results in a flocculent, easily broken clot. The number of leukocytes, especially polymorphonuclear cells, and the protein content are increased, and the glucose level is decreased if inflammation is present. Synovial fluid samples are also cultured and examined microscopically to diagnose a septic process, such as bacterial arthritis. A procedure in which a needle is introduced into a joint and fluid removed for diagnostic or therapeutic purposes. Idiopathic joint effusions or arthritic complaints, suspected infectious arthritis, suspected gout, monitoring of antibiotic response in patient with septic arthritis. Decompress painful joint effusion, evacuate pus from a septic joint, remove inflammatory infiltrate and crystals in patient with gout, inject corticosteroids. Aspiration of fluid from a joint through a needle. Puncturing a joint with a needle to withdraw fluid. 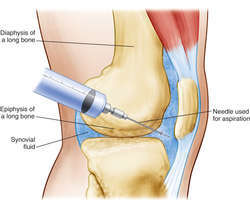 A procedure in which the doctor inserts a needle into the patient's joint to withdraw fluid for diagnostic testing or to drain infected fluid from the joint. 1. Aspiration of fluid from a joint by needle puncture. 2. Sometimes used for a procedure in which an affected joint is flushed with a corticosteroid. surgical puncture of a joint cavity for aspiration of fluid, usually for diagnostic purposes. Two stations were selected: intubation (for day-1 sessions) and arthrocentesis (for day-2 sessions). Treatment of temporomandibular joint osteoarthritis with viscosupplementation and arthrocentesis on rabbit model. TMJ arthrocentesis can be an effective treatment modality when conservative measures alone fail to relieve the TMJ pain. In our case, given her risk of disseminated infection, surgical intervention and antibiotics could have been initiated sooner, when Gram stain of the initial arthrocentesis was reported. The smears were prepared on glass slides with 10[micro]L, without centrifugation, immediately after arthrocentesis and were stained using the quick panoptic method. Serosanguinous fluid was removed from the intertarsal articulations by arthrocentesis and placed in a blood culture media in an attempt to improve culture sensitivity. Arthrocentesis of the hip is traditionally performed in the fluoroscopy suite by interventional radiologist or in the operating room by orthopaedic surgeons. 6,9) Pain persisting after TMJ arthrocentesis is generally related to a great amount of JE and erosive condylar OA. A systematic review by Dunn & Turpie (2003) found that patients taking oral anticoagulation rarely suffered with major bleeding whilst undergoing dental procedures, arthrocentesis, cataract surgery, ureterorenoscopy, and upper endoscopy and colonoscopy with or without biopsy. Arthrocentesis of her left knee was performed which yielded joint fluid containing 200,000 WBC/[mm. 8 mL disposable non aspirating syringe with a long needle The applied technique consisted of a modification of the arthrocentesis technique proposed by Nitzan, et al.